All Geeks Rejoice: Decklist Ex Machina #1: Branch Panch! Our first deck is Branch Panch! For those of you that don't know what a panching is, it's basically punching only ten times more manly because you can get away with spelling it wrong. This deck focuses on the card Reach of Branches. I was looking through cards that play around with the graveyard and found this and was immediately intrigued. See the beauty of the card? It's a forest as well and it just so happens to love Treefolk in your hand. But don't get too excited. This isn't a basic land. The rules state that this is a nonbasic land that is still affected by anything that could affect a "Forest". Don't worry, I have some ideas for that. I will admit, I was conflicted at first. I don't like Treefolk decks. I was going to build this as a monogreen deck that abused Reach of Branches but I thought of something really tempting: Doran, the Siege Tower. Doran doesn't switch power and toughness, he reassigns damage. What this means is, Doran is basically a 5/5 and he's going to make all of our tokens 5/5's as well. That's all kinds of badass. Plus, have you ever known of a tree with a freaking title? "Siege Tower" invokes fear into the hearts of your enemies. 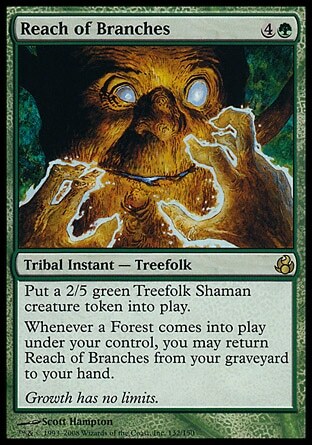 Treefolk Harbinger: Most treefolk cost a ton of mana to cast (hence why I have a distaste for them as a tribal theme). This guy (or..girl tree?) is an exception to the rule. Harbinger also does exactly what this deck needs: searches for a "Forest" or a "Treefolk". 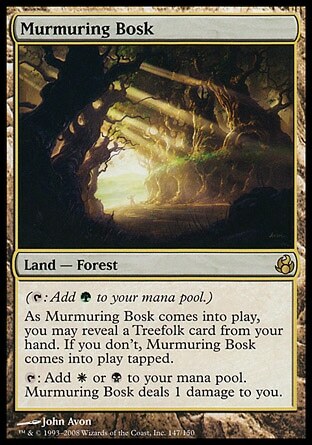 One mana to get a blocker and either get our Murmuring Bosk or our Doran (or other threat)? You are a keeper. Did I mention that Doran makes this a 1 mana 3/3 creature? Sakura-Tribe Elder: Still one of the greatest search for land cards green has to offer. The beauty of this guy, for those who don't know, is that you can sacrifice him at instant speed. What this means is, someone swings with their dude, Elder blocks, then you sacrifice him in response. You don't take any damage and you get to search for a land. This deck really needs to search for lands. You're going to need the right kind of mana to cast Doran and Ranch of Breaches is very demanding. Not only do you need the 5 mana to cast it but you need to be able to constantly chuck forests onto the field to keep returning it. Also, Elder allows us an interesting trick: After your opponent declares attackers, you sacrifice the Elder and get a Forest during their turn. Reach of Branches is an instant so you can play it and throw out a token they never saw coming. If Doran is out then you just gave them a 5/5 ninja treefolk. Say that with me, "NINJA TREEFOLK!" Feels good doesn't it? Yavimaya Dryad: Not only does this search for a Forest but we get a nice creature out of it. If you're just sick of Forests or really just don't need another, you can target your opponent. Give your opponent a Forest and the fact that Dryad here has Forestwalk means she gives herself unblockability. Sylvan Ranger: This is basically the opposite of Sakura-Tribe Elder since it searches when it enters the battlefield. Just like Elder, it gives us the option to search for any basic land if we need it. So we're putting in one Swamp and one Plains just in case for Doran's sake. You're probably thinking, "Jeez Ky. That is way too many cards devoted to searching for lands." You would normally be right but remember the two most important things about this deck. First - If we have enough mana, every time we put a Forest into play, we can cast a 2/5 creature that Doran will basically turn into a 5/5. You need to keep searching for lands to get that 5 mana you need and we need to make sure we can reliably bring back Reach of Branches over and over. Second - Doran costs 3 different colors. If you can't search for them, you can't cast him. There are options for our lands but you'll have to scroll all the way to the bottom for that. Another thing to think about is the fact that searching for so many lands means we are filtering our deck. The less land cards in the deck means the less we draw into. Drawing into our actual threats is a great thing. Enjoy it. Oracle of Mul Daya - This one is up to you honestly. I will admit that it's fragile and costs 4 mana. It isn't an amazing card as the rule always goes: If it costs 4 or more it better win you the game. Personally, I'm putting this one in. It's basically drawing cards almost every turn and allowing insane plays that normally wouldn't happen. It can potentially help us drop two lands during most turns and makes the deck even more reliable than just fetching lands. The fact it gives us card advantage is what makes it shine here. This is just an option but it's an option I like. 1) Protects Doran from spot removal. 2) Pumps treefolk that normally would have low power if Doran wasn't around. 3) Potential to make Yavimaya Dryad deal 6 unblockable damage. 4) You can actually cast this on an opponent's creature. This prevents your opponent from giving their creature an enchantment, casting an instant or sorcery on their creature, equipping the creature, or even using beneficial abilities from their own creatures. I told you this card is tech. 5) It gives you versatility. Plain and simple. Dauntless Dourbark - Read that card twice and realize just how powerful it is in this particular deck. I don't think I need to say anything else. Battlewand Oak - There are better options but I just want to throw this in here for the sheer fun of having Doran and Oracle of Mul Daya out which allows this guy to potentially be a 9/9 40% of the time. If this deck is running at anywhere near full steam then he's at the very least a 5/5 or 7/7 most of the time for only 3 mana. Or put in Leaf-Crowned Elder (see below). Heartwood Storyteller - We do have a couple of spells and one of them we happens to return quite a bit so this guy isn't the best option but since you will probably get more mileage out of him than anybody else, he's very tempting. This card gives the potential for a lot of card advantage. Plus he's a treefolk. Kitchen Finks - An amazing card in most decks as it is. This deck doesn't have any life gain right now and most decks can benefit from that. Life gain attached to this creature and the fact that Finks laughs at spot removal is a huge plus. Very solid. Timber Protector - 5 mana to not only give our Treefolk army +1/+1 but make all Treefolk and Forest cards indestructible? You know what? He's going in the maindeck as a one of. Leaf-Crowned Elder - Kinship for Treefolk and Shamans. All of our Treefolk, Sakura-Tribe Elder, Oracle of Mul Daya, and even our key card Reach of Branches (it's a tribal - Treefolk card after all) have the potential once per turn to get played for free? Forget it, don't look anywhere else. I'm sold. This is the card. Nameless Inversion - Okay I lied. This might be "the" card. How many green decks get to have spot removal that also doubles as a Treefolk? Repeat after me, "NINJA TREEFOLK!" It feels good everytime. Relic of Progenitus - I've been tempted to write an article solely based around this card. It has come to my attention just how much damage this thing does to so many different decks and key cards. Due to this, I put it in just about every sideboard I own. Yes it will touch your graveyard as well but if you can wait then just make sure to get Reach of Branches back to your hand before using it. If you can't wait then it's probably saving you the game anyways and a Reach or two gone is a worthy sacrifice. Krosan Grip - Some people prefer Naturalize but I like having the final say. Rootgrapple/Oblivion Ring/etc. - You need something to deal with Planeswalkers. Rootgrapple is a little expensive but you know how much I love the idea of a Ninja Treefolk taking out a Planeswalker and handing me a card before it disappears into the shadows. There is still some room in the sideboard so just put whatever you want here. Nothing in the sideboard is definitive but they're options that I think give a lot of versatility. But you know better than I do. You know what your friends play and what most people play at your local shop. Put in what works against them. That's what the sideboard is for. The meta. My favorite thing about this deck is that it laughs at spot removal. Having a reliable way to constantly get a 2/5 token is great and you have Vines of the Vastwood and the option to search for Timber Protector. Timber and Reach will also help you against mass removal. If mass removal like Wrath of God is a norm in your area, definitely put Gaddock Teeg in your sideboard. If you have the money to just throw around, go get Overgrown Tomb and Temple Garden. The reason is, Tomb is a "Swamp Forest" and Garden is a "Forest Plains". These would fix your mana issues for eternity and give you more options. With Murmuring Bosk, Overgrown Tomb, and Temple Garden together, you could put more multi-colored cards in this deck. Maelstrom Pulse for example is a great choice but that's another expensive card. Garruk Wildspeaker is an option to think about and yet another amazing option for this deck is Path to Exile. As I said, I build these decks on a budget but I will always try to give some advice on how to throw money into this if you really like the idea. Panching with branches and ninja treefolk. What more could you want?